Unlike most wild game, duck actually has a larger layer of fat than other farm raised poultry birds. This makes duck an ideal meat to smoke on the grill because the fat has time to melt into the meat and add moisture to the bird. 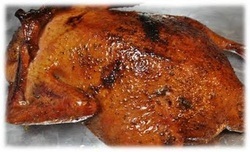 Smoked duck has a strong flavor compared to the mild flavor of most poultry like smoked chicken. That means that your sauces and seasonings don't have to be as strong in order to make the flavor pop right out of a smoked duck. Duck also has large bones so it may be slightly deceiving if you are used to the amount of meat on a chicken or turkey. Use the smoked duck recipes below to create a delicious dish on this wild game bird. Smoked Duck - Many people are fans of smoked duck because it has a bolder flavor than other poultry like chicken. This smoked duck recipe will provide you with a crispy skin and meat that is so moist that it practically falls off the bone.